If you are looking for a great pair of binoculars for your next hunting trip, I highly recommend picking up a pair of Bushnell Bear Grylls 10×42 Binoculars. These powerful, versatile binoculars have a lot of features that make them a great purchase for any hunter who needs a high-quality pair of binoculars. Here is a look at my experience with the Bushnell Bear Grylls 10×42 Binoculars. The first thing you need to know about the binoculars is that the lenses in them are fantastic. The lenses are 10x42mm BaK-4 prisms. These prisms function to magnify the exiting light, which means that the view you see through the viewfinder will be bright and crisp even on cloudy days. I own several pairs of binoculars, but the Bushnell Bear Grylls 10×42 Binoculars are always my go-to pair in foggy or rainy weather because of this brightening effect. One of the first things that drew me to these binoculars is that they are named after one of the toughest dudes on the planet. If you have ever seen any of the shows starring Bear Grylls, you know what I am talking about. I knew a man as tough as he is would never lend his name to an inferior product, and boy was I right. The Bushnell Bear Grylls 10×42 Binoculars can handle the toughest conditions imaginable. The optics are multi-coated to resist scratching, which is great for hunters who will be carrying them through brambles and brush. The design of these binoculars is completely waterproof. You could dunk them in the nastiest ponds or scum puddles imaginable, and they will come out fine after you rinse them off. The shockproof design of the case is another great feature that gives these binoculars added toughness. Whether you drop them on boulders or in the parking lot, you can be sure that these binoculars will survive the harshest falls. In fact, I actually dropped my pair of Bushnell Bear Grylls 10×42 Binoculars out of my moving car one time, and they survived the experience with nothing but a barely noticeable scratch. For me, one of the most important parts of a pair of binoculars is the grip. The grips have to be sticky, but not too sticky. I think the designers of these binoculars have found the winning formula for the perfect grips. The grips are soft enough to rest comfortable in my hands for hours at a time, but they are firm enough to not feel loose when I am gripping them. They have just the right level of tackiness to stick in my hands without staying stuck when I want to let them go. One of my pet peeves when it comes to binoculars is when they fog over. You would think that this would never happen, but I have had even expensive, top-of-the-line brands of binoculars fog over on me in the past. I have never had to worry about my Bear Grylls binoculars fogging over. Even in the most humid conditions, the lenses always stay completely free of fog. If you are looking for a pair of binoculars that is versatile and tough as nails, you cannot go wrong with the Bushnell Bear Grylls 10×42 Binoculars. I have used them hunting, camping, birding and even on a cruise. They have never let me down in the slightest. I have given them a lot of abuse, and they hold up to it in stellar fashion. 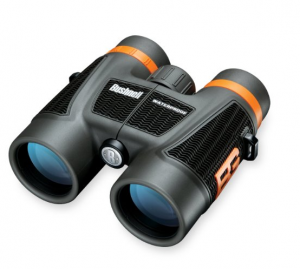 I would recommend these to anyone looking for a great pair of binoculars.